The call for academy-owned open access (OA) journals is getting louder. Today, more scholars and institutions are launching and supporting academic-led journals in order to introduce alternatives to subscription journals and create competition to force down OA article processing charges, which corporate publishers have been increasing upwards of 6% a year. The transition to online publishing is making it easier than ever for members of the academic community to start journals and even flip subscription titles to academy-owned OA models, and they’re showing that they can publish at a fraction of the cost of their corporate counterparts. At Scholastica, we believe that in the future the majority of journals will be academy-owned and we think that the way to get there is by creating tools to make it possible for anyone to peer review and publish professional OA journals easily and affordably. 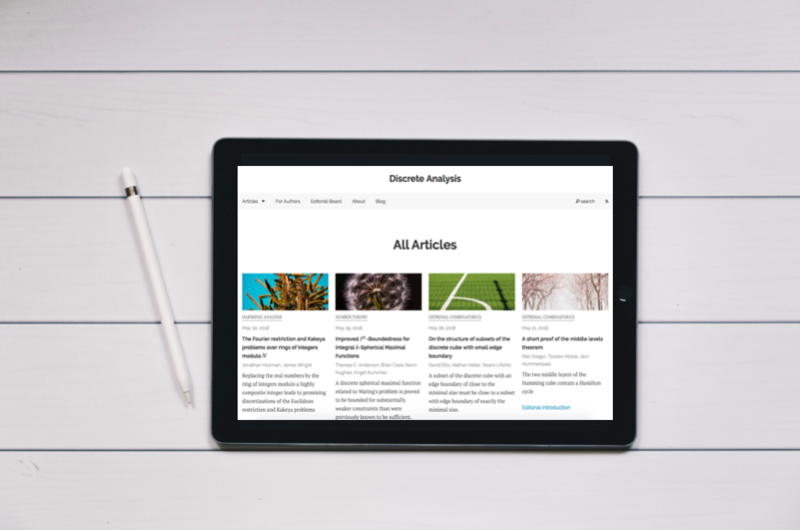 We’re proud to have many academic-led journals using our software and services to manage peer review and to publish modern articles and issues online. We’re starting this new blog series to take some time to highlight some of the impressive academic-led journals using our software. For our first post, we reached out to Fields Medal winning mathematician Timothy Gowers who uses Scholastica software to run two mathematics journals that he founded— Discrete Analysis and Advances in Combinatorics. Gowers has long been a proponent of academy-ownership of research. In 2014 he released a blog post with the findings of public-record requests for the details of university Big Deal contracts with corporate publisher Elsevier. You can see a visual representation of the data here. The revealing expose showed the exorbitant costs of Elsevier’s Big Deals (bundled journal subscriptions), long hidden behind confidentiality clauses in the publisher’s contracts, and it helped to increase scrutiny over corporate publishing fueling the OA movement further. Gowers has since continued to raise awareness of the costs of corporate journals - both subscriptions and APCs - that are crippling library budgets and he’s taken action to begin shifting the balance of publishing power back to the nonprofit sector by launching academy-owned journals and encouraging others to do the same. In March of 2016 he founded his first free-to-read and free-to-publish-in Diamond OA journal Discrete Analysis. The journal operates using the arXiv overlay publishing model, in which peer-reviewed articles are hosted on the arXiv preprint server with DOIs designating their published status. Now, just two years later, Gowers has launched Advances in Combinatorics, a second arXiv overlay journal. Using the arXiv model, both journals operate with virtually no production costs. Using Scholastica software, Gowers and his team were able to set up a streamlined peer review and publishing process for Discrete Analysis and now Advances in Combinatorics. Scholastica’s arXiv integration makes it possible for their authors to directly import manuscripts into Scholastica from the arXiv. Using Scholastica Open Access Publishing tools, both journal teams were able to create a professional publication website quickly, giving readers a modern browsing experience by showcasing images and descriptions of articles on the site that link to the full versions on the arXiv. Gowers believes that scholars should take a grassroots approach to transforming the academic journal publishing landscape to ensure that OA publishing is affordable now and in the future. He acknowledges that while individual academic-led journals may not take power over research from corporate publishers right away, such initiatives can signal discontent within the current publishing system and begin to radically shift market forces. Gowers and a group of colleagues, including Mark Wilson, Björn Brembs, Alex Holcombe, Benoît Kloeckner, and Johan Rooryck, are working to encourage others to support and run academy-owned journals with the launch of the Free Journal Network. FJN is a network of journals run according to the Fair Open Access Principles that academic-led journals can apply to become a part of. Additionally, FJN offers support for academic-led journals via its blog and GitLab forum where scholars can find and post OA publishing resources and advice. You can learn more about Discrete Analysis and Advances in Combinatorics by visiting the journal websites. Are you interested in launching or supporting an academy-owned journal? Be sure to check out FJN for advice and support. Additionally, we overview the driving forces behind the academic-led publishing movement and how to launch academy-owned journals in two new resources “Welcome to the age of academic-led journal publishing,” a free public resource page, and our new guide to starting and supporting academy-owned journals, The Essentials of Academic-Led Journal Publishing.